Two weeks ago I was gripped by an idea for a pattern that won't let me go - most annoying because every time I think I've worked it out it suggests some improvement to me and I have to rip out and start over - and between that and the spinning it's been a struggle to get going with Deco. I've finally made it farther than I did on my first try, which means I'm once again pulling yarn from a perfectly-wound part of the cone. Huzzah! Kate Davies writes patterns beautifully and I am totally in love with the yarn I chose (St-Denis 'Nordique') which does everything I want, is feltable, is incredibly flexible across many needle sizes, and feels not scratchy - a lot of ask from a feltable wool. In fact, while knitting away at Deco in the car on the weekend I found myself concocting a pattern of my own for it which would require me to buy even more than the four cones I already have; I suspect the pattern is incidental to the opportunity to choose more colours. 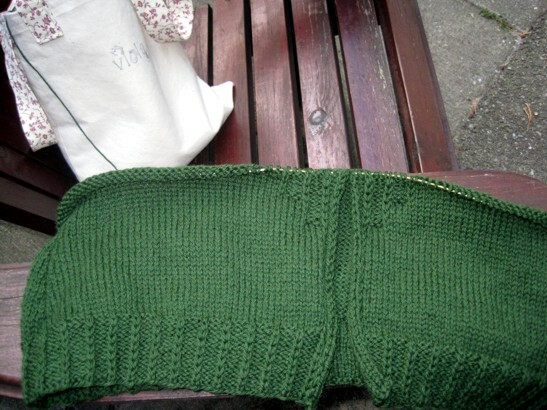 Ideally I would work a bit on the cardi every day, and in fact I think I should make that a specific goal, like the way I made spinning every day of the Tour de Fleece is mandatory except on rest days. But I don't think the gas meter replacement guys are going to understand why it was more important to get another row or two in on my sweater than to clear out the storage room so they can get to the exterior wall in the morning. Work: cut out for me. Really you are being totally helpful to me on all counts with this knit! I plan to work Deco, 'have been thinking about the length and shaping and sizing aaaand you're using the yarn I'm contemplating instead of the one recommended in the pattern! All presented in these helpful posts! Thanks eh!